“I grew up a Hispanic kid in Oklahoma. After high school, I attended the University of Oklahoma. During my sophomore year, I was thinking of transferring to American University in Washington, DC, to pursue my interest in government. This would have required taking out significant school loans. I was going to do it, until I realized that all of the classes I wanted to take were law-related. So, I started thinking about law school instead. I completed my undergraduate degree the University of Oklahoma, graduating with a bachelor’s degree in public administration. I went on to attend Cornell University Law School. After graduating, I moved to Dallas and joined the Dallas County District Attorney’s office as a prosecutor. Next, I worked as a lobbyist for a heavy steel manufacturing company, focusing on employment issues. After that, I joined a law firm, where I focused on employment law. In 2000, I joined Southwest Airlines, where I am now managing director and deputy general counsel. What attracted me to Southwest was not a love of aviation—I hadn’t really flown all that much before joining the company. No, it was the people and the environment. As a lawyer you don’t necessarily feel comfortable everywhere you go, but even lawyers are accepted and included at Southwest. You can tell that people really love being here. I remember on one of my interviews, I was walking down a hallway and the walls were covered with framed photos of Southwest employees and their pets—cats, dogs, parrots. There’s also a wall of photos of couples who met at Southwest. Both Southwest’s cofounder, Herb Kelleher, and our current CEO, Gary Kelly, appreciate the importance of our culture and help maintain it by leading with empathy and humility. I find these leadership traits most admirable. In the beginning, Southwest launched a low-fare revolution. The goal was to combine affordable fares with excellent customer service—and it worked. The US Department of Transportation refers to it as the ‘Southwest Effect.’ It’s what happens when we enter a market—the fares begin to go down and passenger demand goes up. Southwest has experienced over forty-three consecutive years of profitability. We carry more passengers in the US than any other domestic airline, in terms of originating domestic passengers boarded. What has kept me at Southwest so long is that I enjoy being part of a cause. Our cause is to connect people to what’s important in their lives while keeping fares low. In my role, I’m responsible for the labor, employment, and litigation sections for our legal department. A number of teams report to me. The labor and employment team provides counsel and guidance to our leaders on employment issues. My team’s responsibilities include presenting arbitration, responding to government charges, supporting collective bargaining, leading investigations under our harassment policy, and managing employment litigation. The litigation team partners with all departments on any litigation matters other than employment. That includes commercial litigation, insured/uninsured litigation, intellectual property issues, e-discovery, small claims matters, and third-party subpoenas. Personally, I enjoy meditating on matters and resolving issues. I know how to navigate through opposing views and positions to reach a reasonable outcome. My goal is to be a reliable resource and to use my talents for the benefit of the company. My teams are constantly working to ensure that Southwest is compliant with changing laws or new laws in destinations we serve. For example, if Southwest begins service to another country, we analyze applicable laws and partner with our business and operation folks to ensure we are following those laws. When you serve as many markets as we do, that’s challenging, but my teams do a great job. We like to be proactive to ensure we are compliant. 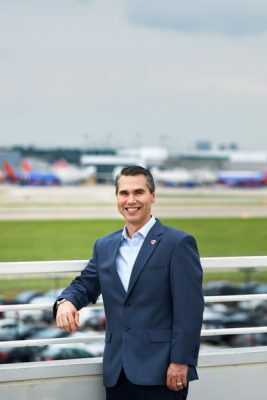 Southwest has always said, ‘We are in the customer service business and just happen to fly planes,’ and I think that’s one of the reasons we’ve been so successful. Our goal is to treat customers like family, and we think that’s why they keep coming back. We’re different from other airlines. For one, we don’t nickel-and-dime our customers. We are the only major airline in the US that does not charge a fee for the first two pieces of checked luggage (with some size and weight restrictions, of course), for example. We also don’t charge change fees. Values like these resonate with our customers. Beyond its customers, Southwest is dedicated to its employees. Our guiding principle is to show the same care, concern, and respect to each other as we do to our customers. For example, in 2015, our employees enjoyed $620 million in profit sharing—that equates to eight weeks of pay. We have also been on Fortune’s Most Admired Companies list for twenty-two years, which says a lot about our work environment. To be a part of the Southwest family has been personally very rewarding. Looking to the future, Southwest will continue to seek ways to enhance the customer experience—whether it’s through improvements in technology for customer convenience or expanding routes. Currently, we serve ninety-seven destinations in addition to Mexico, Central America, and the Caribbean. In 2015, Southwest served more than 106 million peanuts and more than 45 million pretzels. The shortest daily Southwest flight is between Austin, TX, and Houston Hobby at 148 miles. The longest daily flight is between Baltimore-Washington and Oakland at 2,447 miles. Southwest Airlines has had 43 consecutive years of annual profitability. In 2015, average passenger airfare was $154.85 one way. Southwest employees volunteered more than 130,000 hours to national and nonprofit organizations last year.